Oxi Fresh’s Business Coaches are here to support you with your marketing, operations, and service needs. Through training and consultations, your coach will give you the best practices that can help your business grow. 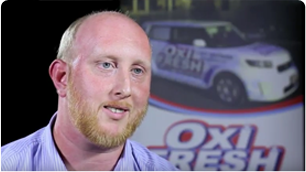 When you’re awarded a franchise with Oxi Fresh, you gain access to a wealth of tools and systems that can help you run all aspects of your business. Our coaches will work through all of these options with you and help create a custom plan for your franchise. Running a business means taking on important responsibilities, but there’s no reason for them to weigh you down. Oxi Fresh has streamlined many of those daily duties for you through instant updates on a day-to-day changes, automatic marketing and customer satisfaction reports, and by partnering with vendors who can handle your HR and payroll needs. Oxi Fresh believes in speed through systems, in creating programs that can make a business run more efficiently and be more productive. The F.A.S.T. system is where all of those programs come together in one easy-to-use platform. With just a single sign-on, you have immediate access to marketing tools, training courses, print materials, and much more. The better your technicians clean, the stronger your franchise can be. To give your team the edge it needs, we’ve created Oxi Fresh University. This comprehensive program has in-depth videos and testing to ensure that your team knows how to clean the Oxi Fresh way.